Brinjal (Baigon) is used in a variety of ways in Indian preparations of various dishes and is a commonly available vegetable everywhere. In this recipe, the detailed method of preparing stuffed brinjal is described step by step. Brinjal is a common vegetable available across our country and is prepared in varying ways and in various cooking methods in different areas. For this recipe, we have to get small sized brinjals - something approximately around 2 inch in sizes. This is the microwave cooking version of the dish. With certain variations it can be adopted for hot plate or gas stove. In any microwave, there are generally 4 to 5 settings of power which give different temperatures and heat for cooking. They are generally known as - very high, high, medium, low and very low. Depending upon the requirement, we have to choose the setting. For example in the case of vegetable cooking, generally the second setting is used while for thawing a freeze item the last setting (4th or 5th) will suffice. The preparation time of the recipe is about 40 minutes. The ingredients and their quantity for this recipe is mentioned below and will suffice along with other main course items for about 3 - 4 persons. Brinjal - 8 to 10 numbers, small sized. Besan (Gram flour) - 2 to 3 tbsp. Cooking oil - 2 tbsp. Cumins seeds - 1/2 tsp. Ajwain (Carom) seeds - 1/4 tsp. Asafoetida powder - 1/4 tsp. Garlic - 6 to 8 cloves. Roasted peanuts broken - 1 tbsp. Mango powder - 1/2 tsp. Black pepper powder - 1/4 tsp. Green Chilli - 1 No. Coriander leaves - 1/4 bunch. Curd - little (4 - 5 tsp) for marination. Salt - as per taste. Clean brinjal and split it in 4 parts in such a way that it remains jointed at the base. Now slowly scoop out some inner part of brinjals to make room for stuffings. Do not scoop much otherwise the petals will become thin and break out. Now sprinkle and paste a little salt, red chilli powder, black pepper powder and curd on these brinjals from the inside and keep aside for sometime, at least 15-20 minutes, for getting them slightly marinated. Meanwhile, let us prepare the stuffings for filling in the brinjals. Keep a pan on medium flame on gas stove and pour oil in it. Let the oil heat up. Now add cumin seeds, Ajwain seeds, turmeric powder, Asafetida, chopped garlic and half quantity of chopped onion and saute for a while. Add gram flour to it and saute till it gives slight roasting smell. Now add roasted peanuts, salt and mango powder and sprinkle a little water and mix well. The stuffing is ready now and keep it aside. Now, fill a part of this stuffing in each of the the brinjals and if required tie a piece of thread around each of them so that the stuffing does not spill out. Take a microwave cooking bowl and line it with a little oil. Keep all the stuffed brinjals in it. Sprinkle chopped tomato, remaining chopped onions and green coriander leaves on it. Sprinkle a little water also to wet the outer surface of the brinjals. Cook it in second setting of heat for about 15 minutes till brinjals are done. Check frequently after 10 minutes of cooking as in microwave the last few minutes are crucial as lack of water sometimes char the dish. If it is observed that brinjals are done then put off the microwave even before 15 minutes. The dish is now ready and can be transferred to serving bowl. This is a dry vegetable and can be served directly on the plate. This goes very well with main course during lunch or dinner. Some people like these stuffed brinjals to be taken as dipped in tomato gravy. In that case tomato gravy can be prepared separately. 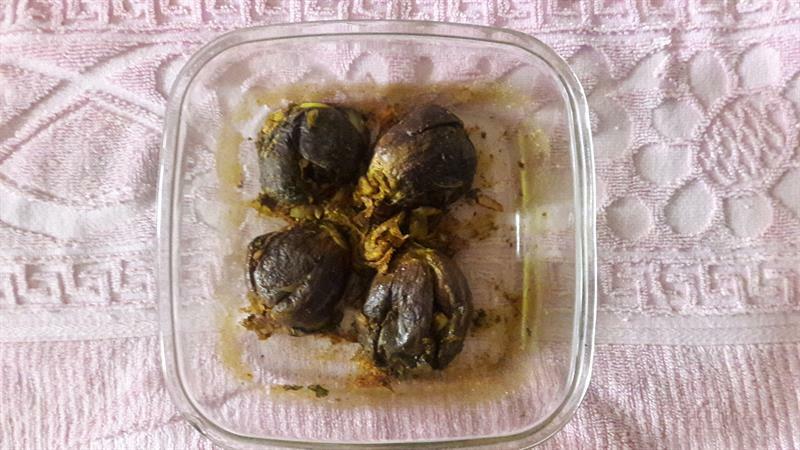 Those who are not comfortable with microwave cooking, can cook this dish in a pan by first sauteing the stuffed brinjals a little bit in the heated oil and then cooking it for 10 - 15 minutes and tossing it in between frequently. Some people mix a little of boiled potato in the stuffing to bring in the sweet taste. In such a case one or two boiled potatoes can be mixed in the stuffing of this recipe. Stuffed brinjals is a delicious preparation and a good side dish during main meal times. It is also a good choice for small get together and parties. A simple but interesting recipe especially for persons who do not like the usual common taste of routine preparations of brinjal. I think this stuffing will also be successful in long brinjals where we can split them longitudinally and fill the fillings in between and tieing around. For those who do not like the dry texture of microwave recipes, they can go for frying these brinjals in low heat so that they do not disintegrate. Even dipping them in gram flour paste and deep frying would be a good variation.